Can a Crossing Guard or Pedestrian Be Compensated if They Were Hit By a Cyclist? A Pedestrian is Hit By a Bicyclist, What Happens Now? With cases like this we suggest that you speak with an experienced pedestrian injury attorney to find out what may be available as compensation for you. Anyone who is walking across or alongside a road or city street is exposed to being hit by a bicycle. School crossing guards have an increased risk of being hit simply because of the amount of time they spend in the road assisting children and others crossing at busy intersections. Crossing guards are exposed to danger each time they walk into traffic to assist someone in the crosswalk. A pedestrian occupying a crosswalk has the right-of-way in most every situation. If a crossing guard or pedestrian is hit by a bicycle while in the crosswalk, one generally presumes the fault would be on the bicyclist. A bicycle riding on the road is considered to be a vehicle under Florida law and must obey all of the traffic laws applicable to a vehicle. That means they must stop before entering the crosswalk if it is occupied and they must take every reasonable precaution to avoid striking a pedestrian in the roadway. 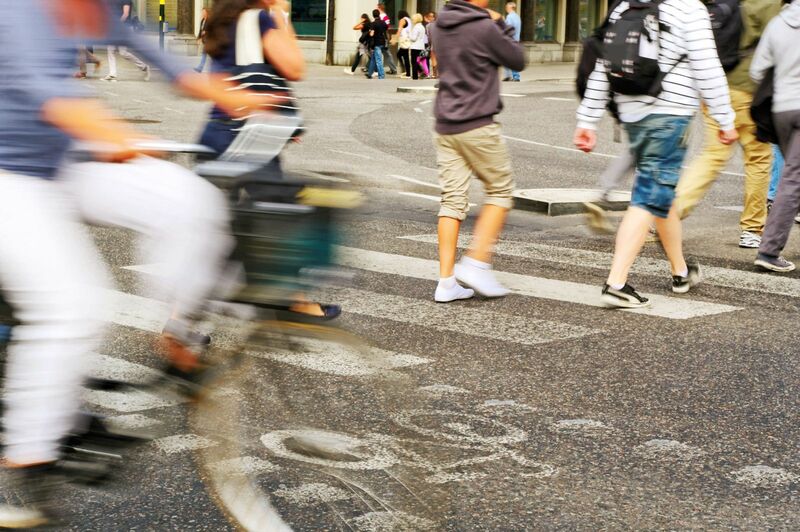 How Does a Pedestrian Recover Damages if They were Hit by a Cyclist? How does a Clearwater pedestrian injury lawyer obtain compensation from a bicyclist who is at fault in causing a collision with a pedestrian in Florida? The most likely source of recovery is from the homeowner's insurance policy of the bicycle rider, assuming they own a home or are a family member of someone insured under a homeowner's policy. These policies typically provide liability insurance for each named insured on the policy as well as family members residing in the home. For instance, if a child who lives at home causes a collision with a pedestrian, the child would be covered under any homeowner's policy carried by the parents. Homeowner's insurance policies provide very important coverage in these cases. Liability insurance compensates the victim for their medical expenses as well as general personal injury damages such as emotional and physical pain and suffering, scarring and lost wages. An experienced Florida personal injury lawyer will understand how to make a claim against a homeowner's policy and will understand the situations in which the policy will apply. It is common for homeowner's policies to have liability insurance of at least $100,000. Many have coverage of $300,000 or more. If the bicycle rider is not covered under a homeowner's insurance policy, another potential source of recovery is a renter's insurance policy. Renter's policies provide very similar coverage to a homeowner's policy. Unfortunately, in our experience, renters rarely purchase this coverage, even though it is very inexpensive and offers great protection. Again, an experienced Florida pedestrian injury lawyer will know how to locate and make a claim against this coverage, if it exists. Collisions between bicycles and pedestrians can cause very serious and devastating injuries, depending on the speed and force at impact. Bicycles are virtually silent when approaching a pedestrian on the road, giving virtually no warning of imminent danger. The pedestrian or crossing guard is typically unaware they are about to be struck and have little opportunity to guard themselves or attempt to avoid impact. The opportunity for significant injury can come from the impact with the bicycle and from being knocked to the pavement. It is very common for a pedestrian to suffer fractures, serious lacerations with scarring, and concussions with the potential of permanent traumatic brain injury.